When the chat request is submitted, the web visitor will be in a virtual lobby and they will wait for an answering agent. 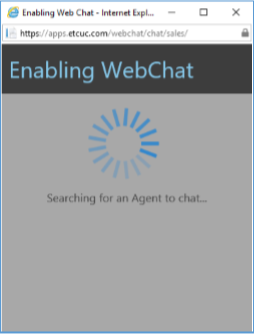 The web visitor will see ‘Searching, Authentication and Searching for an agent to chat’ inside of the Chat Request Form. At that time the Agents in that group will receive a toast notification in their chat client. *** Note: Chat requests are only sent to agents who have their presence set to ‘Available’. Agents who are in a call, have the status set to Busy or Away, will not receive a chat notification.